Today’s modern thermostats have more features than ever, so let our thermostat installation experts bring your Tampa home into the modern world. Look at your Tampa, Florida home’s current thermostat. Do you see heat, air, off, on and auto, but not much else? If so, you could be missing out on incredible energy savings and convenience. 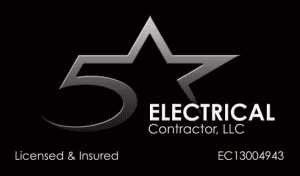 At 5 Star Electrical LLC, our thermostat installation services can bring you the ultimate in technology that can be had with today’s newest marvels. We can also overcome shortcomings such as bad placement, which can make your HVAC system run less efficiently. You have a smartphone, why don’t you have a smart thermostat? Imagine such features as a talking thermostat or one that you can control by voice. Wouldn’t that be handy? Granted, those thermostats that have smart features do need to be part of a smart house setup, but we can help you with that, as well. Even if you aren’t interested in going the smart thermostat route, we can also help you with thermostat installation that offers other bells and whistles your current one might not. For example, humidity control will tell your HVAC system to set itself a few degrees cooler if need be to get the humidity level where it is best. Humidity in Tampa, Florida can be off the charts, but you don’t want the humidity level in your home to ever be above 50% if you want to avoid mold and mildew conditions. Programmability is something that is easily done with a smart thermostat, but can also be accomplished with other types. You can save an incredible amount on your utility bill by adjusting the temperature a bit when you won’t be at home. These are just a few of the features that you can enjoy with a new, modern thermostat. Let our thermostat installation experts help you decide which is right for you and has the features that mean the most to you.